Elevators go up and down, but these officers from the El Paso County Sheriffs’ Office have discovered it’s a lot more fun to get down when you’re inside that little metal box. 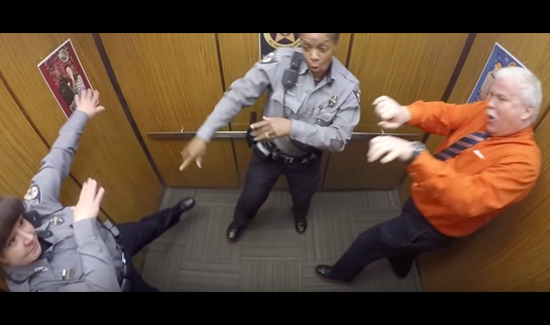 Colorado sheriff’s deputy Tony Scherb was so excited on his retirement that he couldn’t help but bust a move or two when rapper Silentó’s “Watch Me (Whip/Nae Nae)” came on in the elevator. He even gets some colleagues in on the fun, but notice how they all suddenly become all professional when the boss walks in. The department made the video to honor Scherb on his big day….and it quickly went viral, with over 3.5 million views since it was posted on January 29.